TCA Members – Stay Informed! As we are beginning a new year we would like to know if you are doing well. This e-mail is a way of making sure that no member falls through the cracks. Reaffirming your membership information is something we would like to do because we care about every single member. If you are a PUFL member we will be sending out the 2019 membership cards soon and need to know if anything has changed in your mailing address. If you are not a PUFL please remit your membership dues of $5.00/year to me so I can get you a new card. All members please reply to this notice with a simple OK to help us update our records. The book, “Following the Path” is available for purchase as a 6 X 9 soft-bound print copy for $14.95 plus S/H that runs about $6.50. Book Synopsis: Harvey H. Klee was appointed National Chaplain of The American Legion at the Legion’s 98th National Convention held in Cincinnati, Ohio August 2016. “Following the Path” is a true story of his experience while serving in that capacity. It contains all of the prayers, memorial services, speeches, articles, reports he wrote while National Chaplain, etc.,and the events leasing up to his appointment – including the controversial speech he gave at the Legion’s Patriotic Memorial Service in Reno, Nevada the following year.. 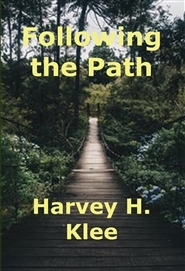 Following the Path is also available as an eBook downloadable directly to your computer or other device. The price is $10.95 and there are no shipping and handling charges involved. Just click on the button below to order. Congratulations to our new Department Chaplain 2018-2019, Gerry Hince who was appointed by our newly elected Department Commander, Lloyd Buckmaster. Chaplain Hince serves as a member on the Board of Directors of the Texas Chaplains Association and is it’s Vice President. We hope to have a photo to post soon.